Ben Roethlisberger is now 6-0 against Joe Flacco. The Baltimore Ravens have only lost 4 road games in the playoffs, 3 of which are at Heinz Field. Hines Ward now has 78 career postseason catches which ranks 5th all time. Both Terrelle Suggs and James Harrison had monster games both posting 3 sacks. Harrison was particularly impressive destroying all pro talent Michael Oher on almost every single play. LaMarr Woodley's streak of 2 sacks in every playoff game he has played came to a halt when he had 1 against the Ravens. Troy Polamalu recorded only 2 tackles but his safety partner Ryan Clark had a game changing forced fumble and interception. Ray Rice's fumble was his first in over 400 touches. The Ravens had more turnovers than yards in the third quarter, 3 to -4. The Ravens scored 17 points off turnovers and had only 126 yards of offense. Joe Flacco's receivers let him down in clutch moments with drops from Anquan Boldin at the goal-line and TJ Houshmandzadeh on the final drive. The Steelers special teams remains their weakness giving up big plays all night. Antonio Brown announced himself as a legitimate NFL receiver leading the Steelers in receiving and making a huge 58 yard reception to set up the game winning touchdown. Rashard Mendenhall had his best game against the Ravens with an outstanding goal-line run for the game winning touchdown beating 4 potential tacklers. The Steelers are going to their 15th conference championship and their 5th in the past 10 years. The Steelers will face either the New England Patriots in Foxboro or New York Jets in Heinz Field next week. Aaron Rodgers confirmed his status as an elite quarterback with a huge performance against the no.1 seeded Falcons in Georgia. TD to add to his 3 through the air. Rodgers became the first ever quarterback with a rating higher than 120 in his first two playoff games and extended that streak last night in his third playoff outing. Eric Weems had the longest Kick Return for a touchdown in the postseason in NFL history with a 102 yard effort. Aaron Rodgers has 10 touchdowns in his first 3 Playoff starts, that is a record for any player ever. Tramon Williams justified the release of Al Harris during the season and confirmed himself as one of the biggest Pro Bowl snubs with two interceptions including a moral killing touchdown return at the end of the half. 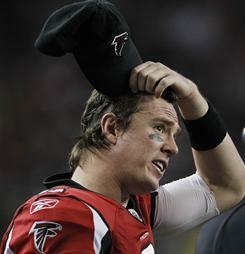 Matt Ryan is still looking for his first playoff victory, as is Tony Gonzalez who was playing in his fourth playoff game. John Abraham continued to underperform in big games as he recorded 1 sack and nothing more. Greg Jennings recovered from an early fumble to lead all players in receiving yards with 101. The Packers are only the third team ever to beat Matt Ryan in the Georgia Dome. Clay Matthews and Charles Woodson continued to come up big for the Packers combining for 3 sacks and 10 tackles. The Green Bay Packers would be the first ever 6th seed from the NFC to win the Superbowl should they get there. The 2005 Pittsburgh Steelers are the only ever 6th seed to win the Superbowl. The Packers outgained the Falcons by 442 yards to 194 yards in total offense. The Packers will now travel to either Chicago to play the Bears or Seattle to play the Seahawks in the NFC Championship.